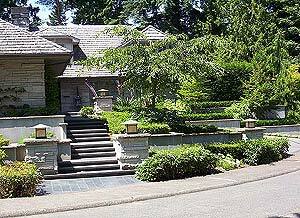 Located near the northern entrance to Broadmoor, this low, L-shaped residence clad in rusticated Wilkeson stone fronts on a curving road and backs up to the Broadmoor golf course. 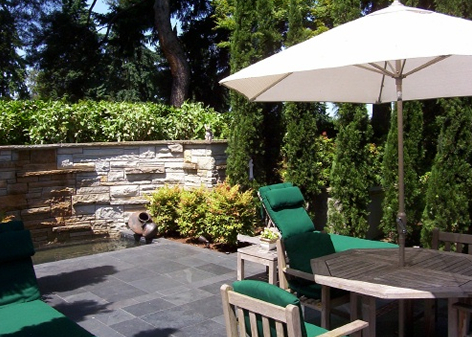 Seattle Landscape Architect Brooks Kolb was hired by the owner to transform an automobile-dominated front yard into a usable, pedestrian-friendly entry garden and to create private terraces for a formal water feature and hot tub in the back and side gardens. 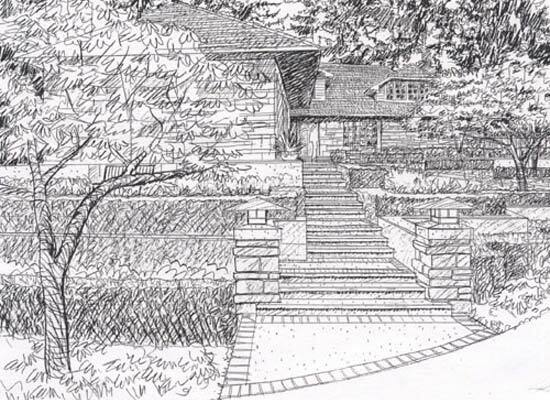 Before design work began, a U-shaped front driveway climbed onto a high bank above a rough-and-tumble pile of granite rock, filling most of the quarter-circle-shaped front garden. 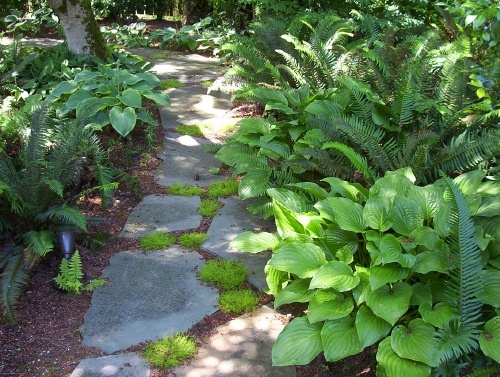 The owner’s first instructions to Brooks Kolb were to remove the rockery so that a sleek, tidy and well-maintained garden could emerge. 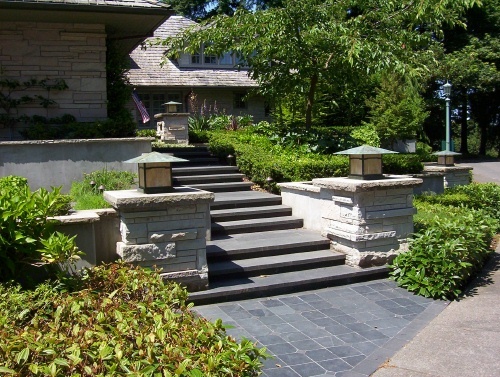 Working with the horizontal lines and distinctive stone siding of the house, Brooks Kolb removed one branch of the curving entry drive, reduced the width of the remaining driveway and set up a perpendicular cross axis for a new entry walk which heads directly from the street up a series of elegant stone steps to the front door. 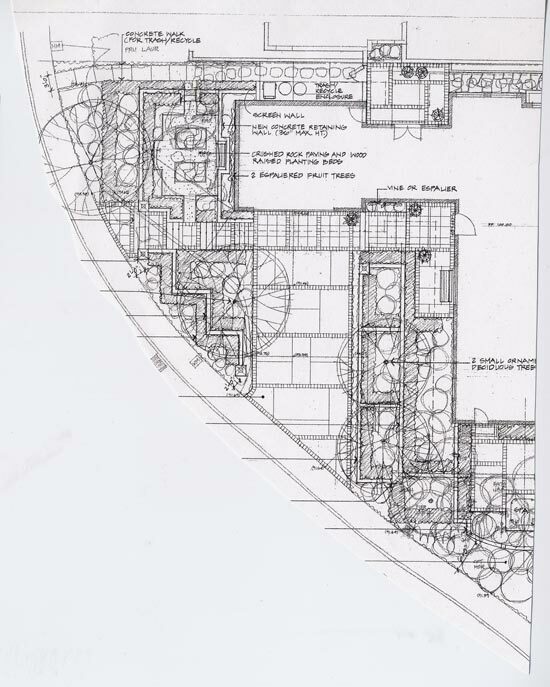 Since the house is situated relatively high above the street, with the front door aligned at a right angle to the garage doors, it was not practical to prevent the front entry walk from crossing the driveway. Instead, elegant black granite and slate paving contrasting dramatically with the creamy tan color of the house was employed to delineate the pedestrian zone. 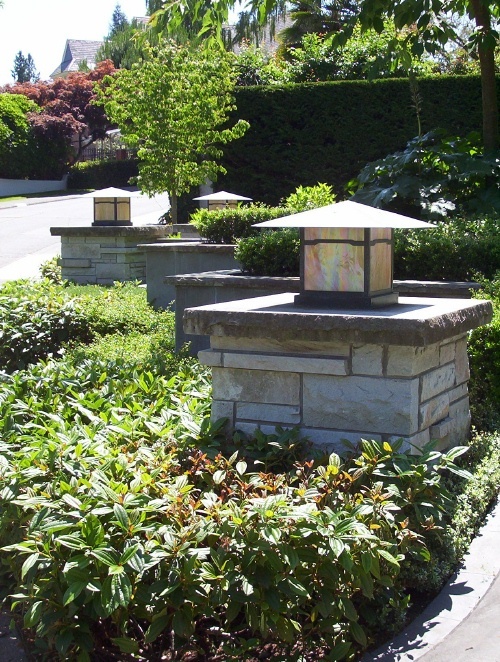 Broad stone-faced light piers topped with Arroyo Craftsman fixtures act as sentinels at the main pedestrian entry. 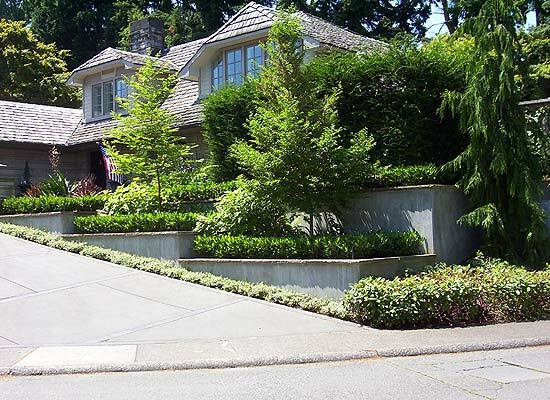 A series of low concrete walls topped with clipped hedges of Otto Luyken Laurel cascade in tiers down the sloping driveway. 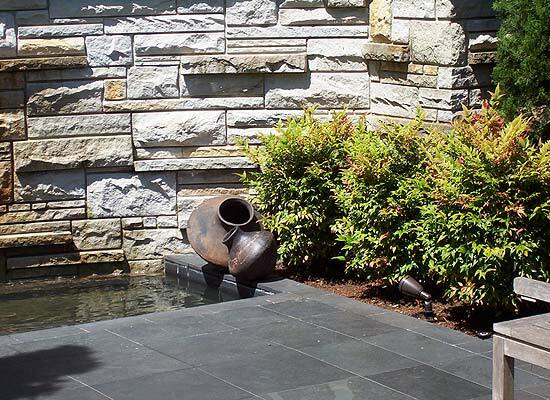 In the back garden, Brooks Kolb cut into a grassy slope to build a curving wall fountain clad in stone to match the house. 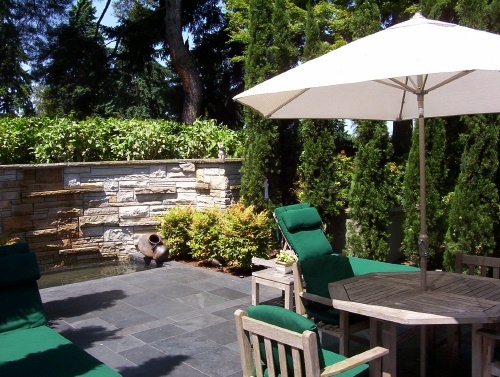 The fountain terminates an axis formed by a black stone seating terrace which extends out from the living room. 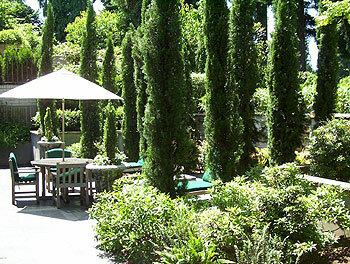 Symmetrical accent plantings of Italian Cypress dramatize the space. 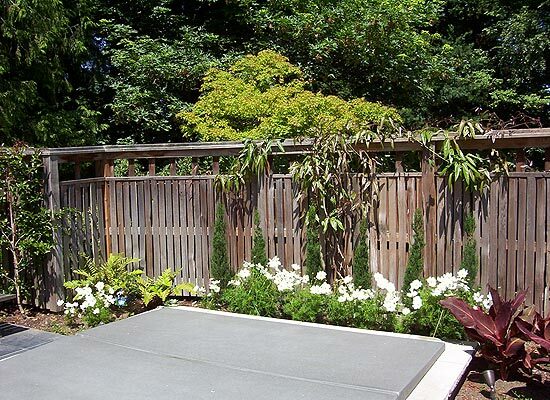 A stone path leads past plantings of Japanese Pieris to a fenced, private hot tub terrace adjoining the master bedroom. 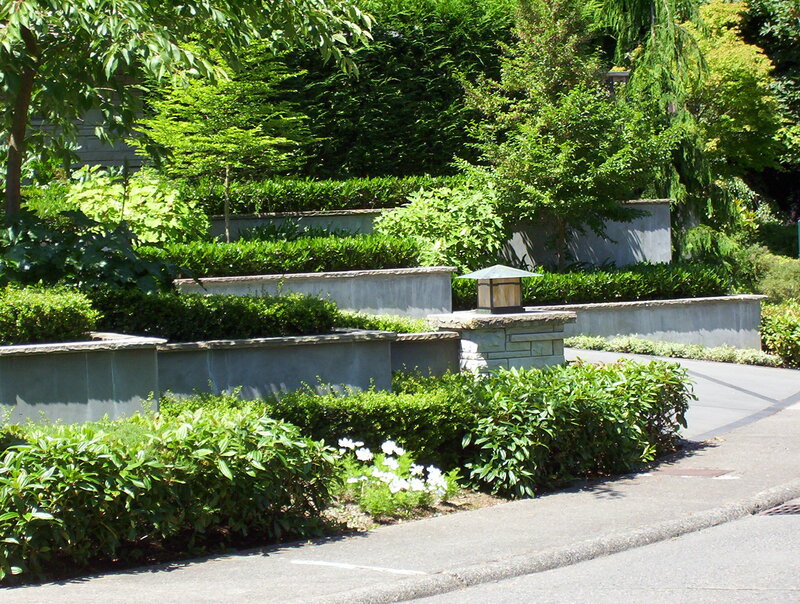 Throughout the design, the Broadmoor community aesthetic of formal, clipped and well-pruned plantings is celebrated. Composed of a tranquil pond with water lilies and a gurgling fountain, backed by a dense semi-circular Yew hedge, this formal English garden provides a pleasing vista from a prominent living room window. Entered from a crushed rock path bordered by low hedges of Japanese Holly, this water garden gives way to a more ample and less formal back garden marked by flowing lawns with mixed perennial and shrub borders. 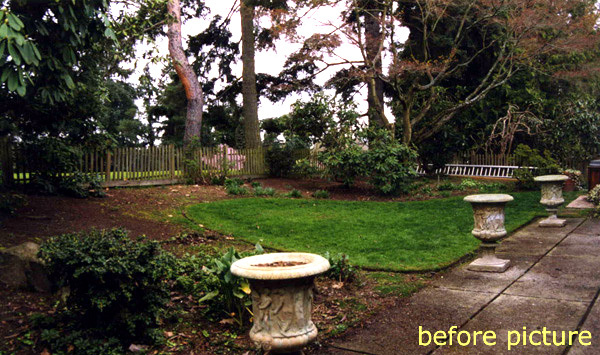 A terraced herb and vegetable garden constructed of wood timbers leads to an octagonal gazebo at the low end of the back garden.